1. Click on the File drop down menu. 2. Click on Open Layout. 3. 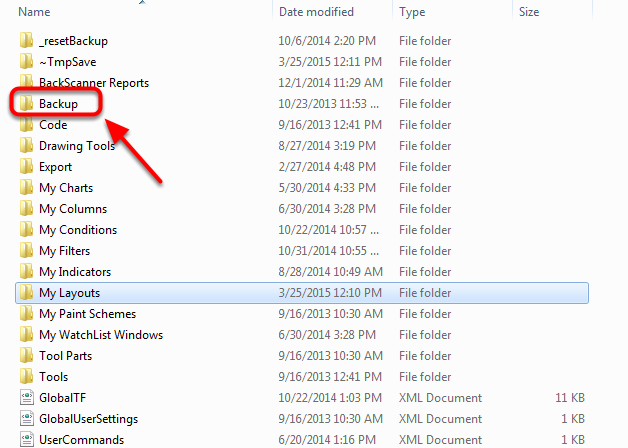 In the address line at the top click on the folder named by your StockFinder ScreenName. Zoom: 3. 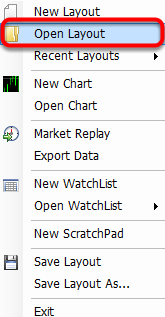 In the address line at the top click on the folder named by your StockFinder ScreenName. 4. Double left click on the folder named Backup. 5. Double left click on the folder named Layouts. 6. Double left click on the folder with the same name as the layout you are attempting to restore. 7. Double left click on the folder named by a string of lower case letters and numbers. 8. Double left click on the numbered copy of the layout you would like to restore. Number 1 is the original save of the layout and and the largest number is the most recent save. The layout should now be restored to the version selected.